My husband has this vacant office that he is stuck in a lease with, until May. It’s loaded with computer equipment for his business, but other than that, it is HUGE, well lit and warm. I’ve been the artist squatting in residence for some time now. The above fish are quite large. They range from 3-4 feet. 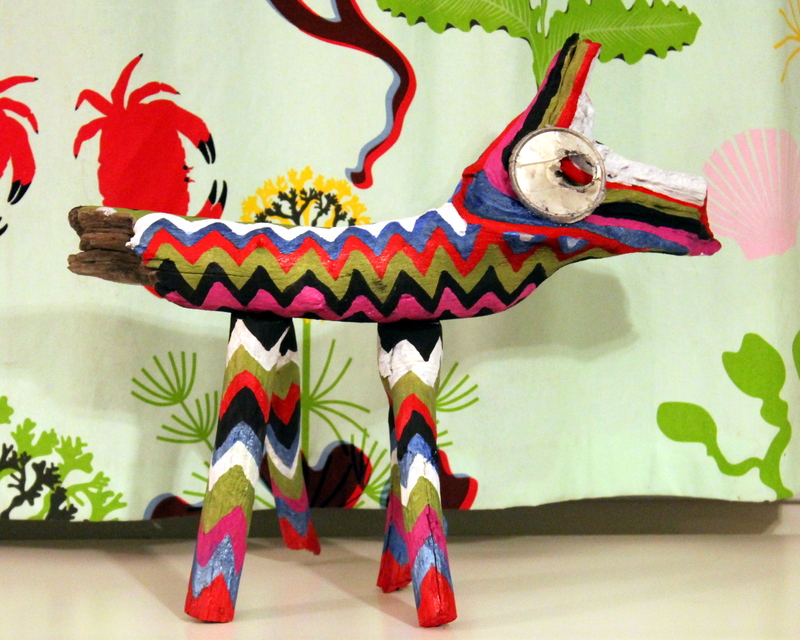 I’m also working on these wall hangings, shadow boxes and sculptures. Each of them are still incomplete. 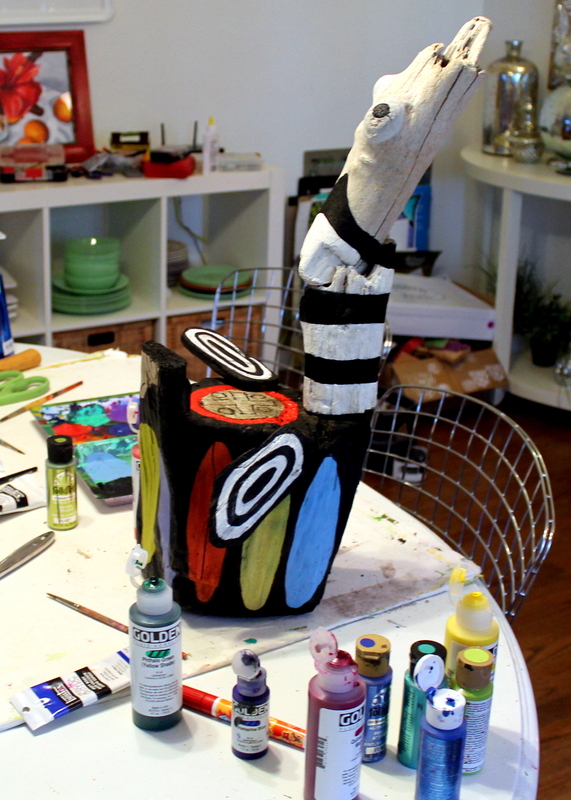 I am going to add pottery elements to each of them to make them more personal. It feels good to finally put a dent in that driftwood collection! I’m feeling organized and off to a good start. I live by the beach. But beachcombing can add up if you don’t find ways to use it. After Hurricane Sandy I made myself a 5 foot mirror. But let me tell you, that wasn’t even half of what I collected! 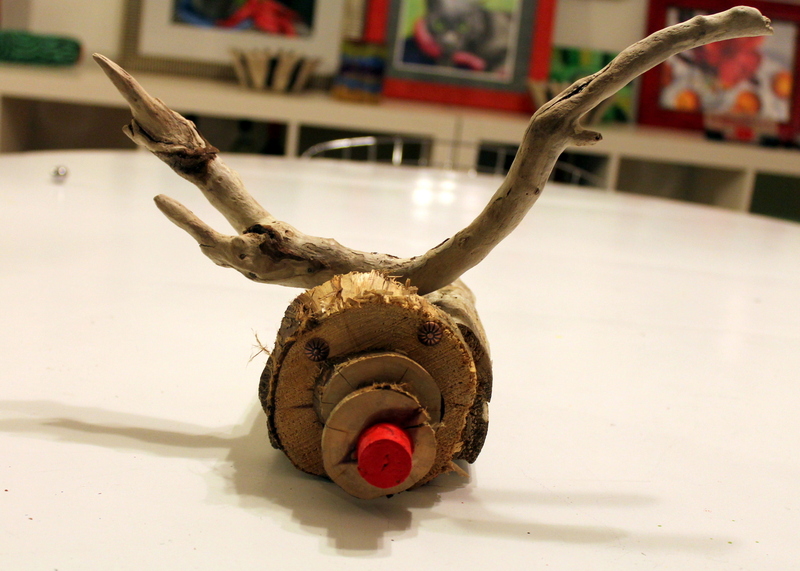 So it’s time to put all this driftwood to good use. Strewn all over the floor, I can begin to look for shapes in the abyss. 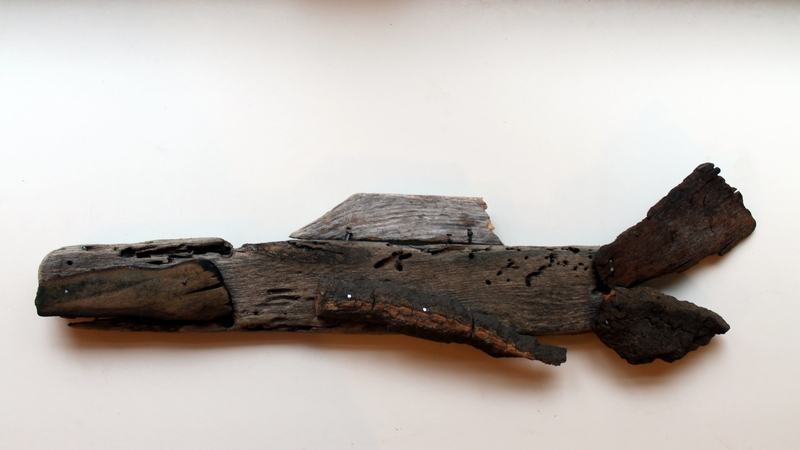 This is the last of my driftwood sculptures. When I found this piece of wood on the beach, I couldn’t help but see a cranky old man. You know, the man who barely says hello when you greet him and he always begins his conversation by telling you what you’re doing wrong. Have you met him? Oh and then put Mr. Grumps around children and you get to see the type of face on my sculpture. My mom lives near a grumpy pants. He always comes out to yell at us. He yelled at us for giving the kids sparklers on 4th of July. Sometimes we park in a place that displeases him. Another time he said it was only ok for my mom to bring 3 out of her 4 grandkids to the pool because she’s only allowed 4 guests. The best one was this weekend. My mom lives in a condominium that might as well double as a nature refuge. It’s beautiful. All the units are on a lake. Instead of watching TV, I went outside with the kids to check out the frozen lake. The lake had about a half-inch of ice on top. The kids threw rocks and sticks to watch them glide over the surface. Then they made a hole and watched the air bubbles float under the ice. I’d call it scientific children’s play. They were testing every possibility they could come up with to see what they could do with this giant body of ice. Of course Mr. Grumpy Pants saw us from his window. Could he mind his own business? Could he maybe take a deep breath and refrain from coming outside to say something? Nope. He couldn’t contain himself. Mr. Grumpy Pants just couldn’t leave us be. He had to say something. The world unfortunately has its share of grumpsters. I told my mom to have compassion for the guy. Maybe he had domineering parents when growing up, maybe he suffers from a mental illness or still yet maybe, quite frankly, he’s just a cranky old man. When you look at these people as wacky cartoon characters, it becomes easier not to engage or take it personally. The moral of my long-winded story is – be kind. Don’t be a Mr. Grumpy Pants. However, if you should happen to cross paths with Mr. Grumpy Pants and he starts in on whatever he could come up with for the day, just smile and count your blessings. Sometimes we have to experience misery in order to recognize kindness when we see it. 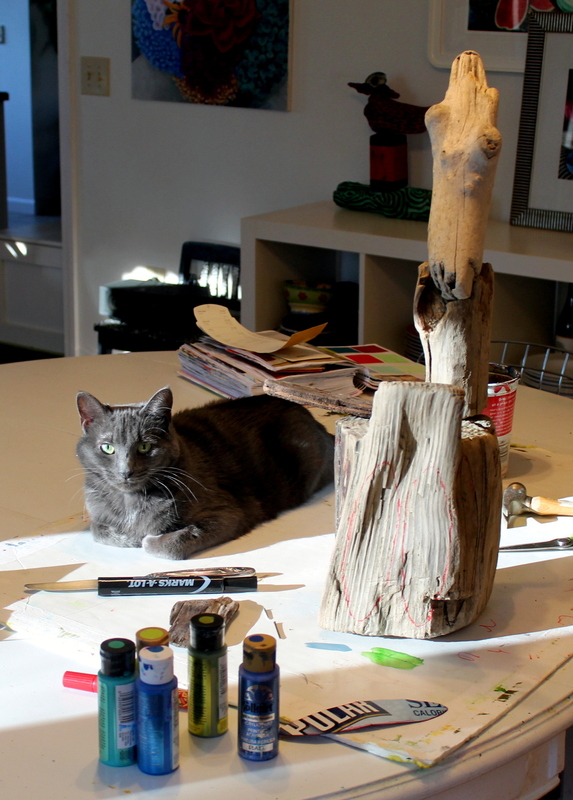 I’m thinking of sending my mom the sculpture Mr. Grumpy Pants. This way when she has a tough encounter, she can go back inside and stick a tack in him. This will work great…until we run out of room! I totally asked for it. Tonight, as we were sitting down to dinner, I asked the kids what they thought I should title my post for today. 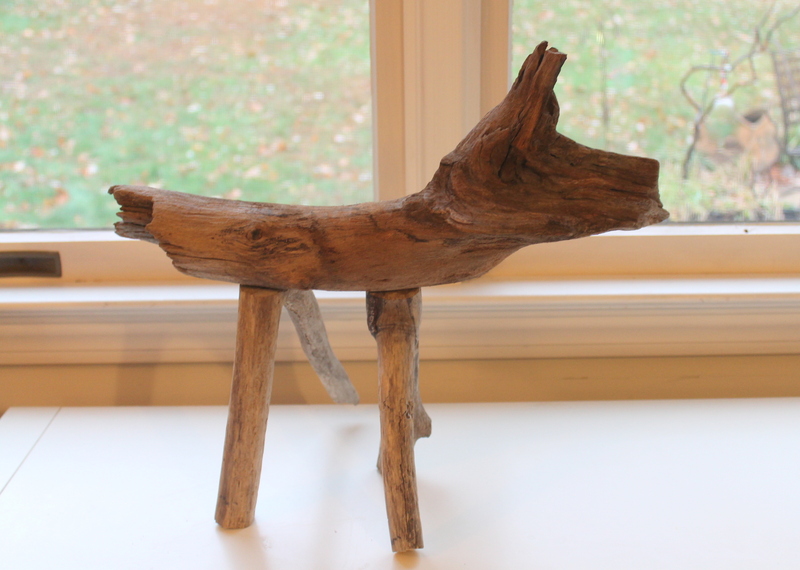 I asked if they had any good names for my dog I created out of driftwood. 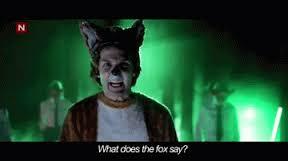 Does everyone know this video by now? The kids are going wild for it. It is the most ridiculous thing I’ve ever seen or heard, but just like a car accident, I just can’t help but peak and maybe sing a little! So that is it. Even though I designed it to be a chevron dog it is now 100% fox. 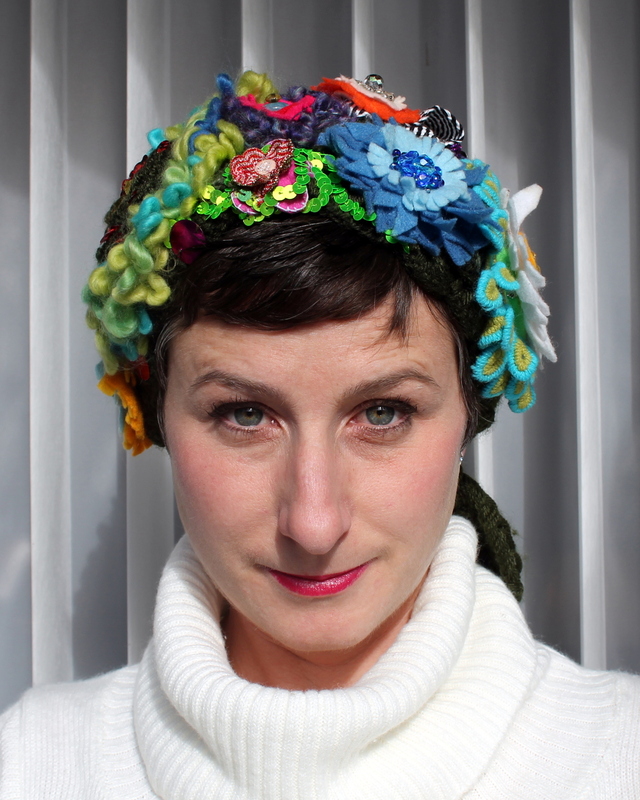 Last night I posted my Granny Chic winter head wrap. It was too dark to get a photo of it on, so I took one this morning. This was wild. My mother has my self-portrait from day #1 of my creativity challenge. 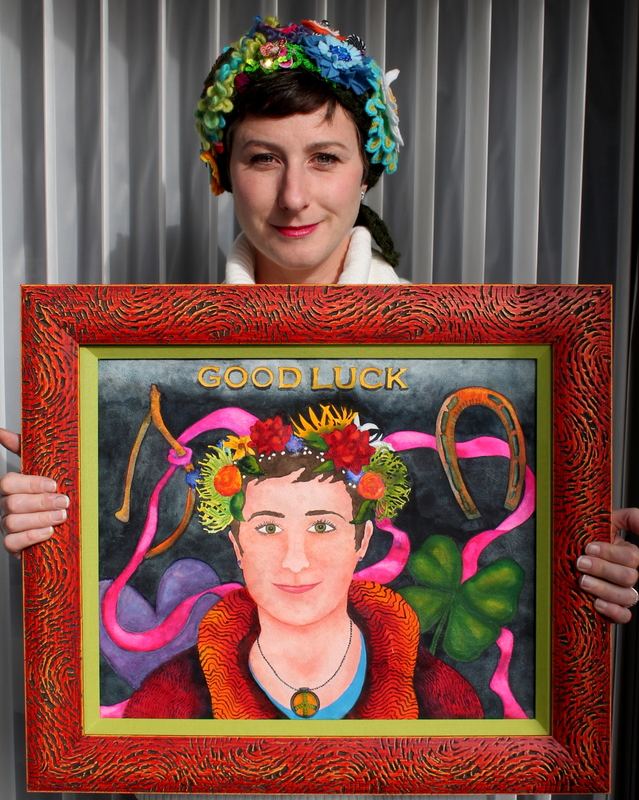 I didn’t put two and two together, but as I was walking out of her house I saw it and thought to myself “this is totally freaky.” I inadvertently created the same wreath for my head as I had in my painting over 300 days ago. I had no intentions. The wreath in the painting was a floral wreath I wanted to wear to my first holy communion. My mother, still in shock that I didn’t want to wear the veil like all the other little girls allowed me to wear a crown of baby’s breath. Totally not what I wanted. I wanted red roses, mums and sunflowers just like I had seen at a hippy wedding back then. Hey the heart wants what the heart wants. Now I have my wreath! 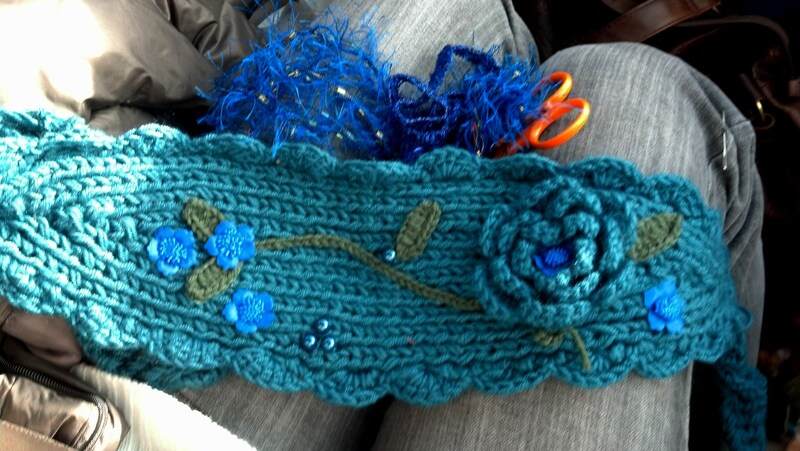 On my car ride home today I created a more tame version of a head wrap. 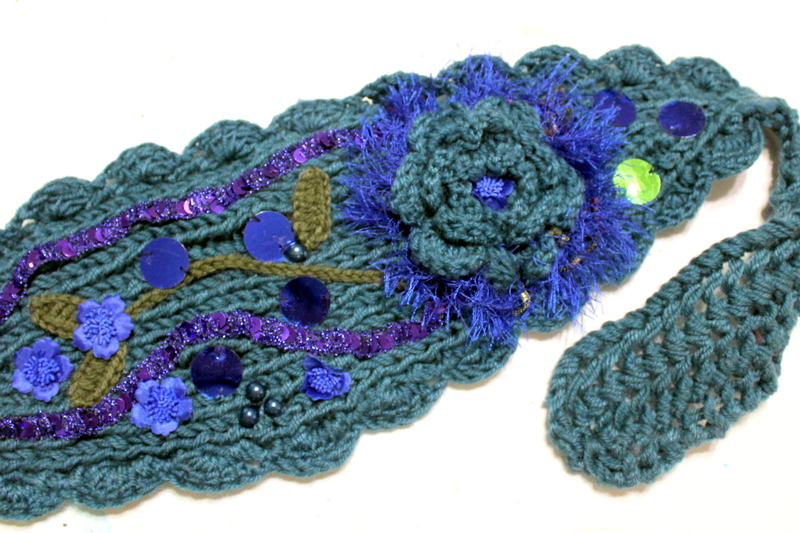 This prefab was still a little to simple for my taste, so I added some yarn and sequins. I also had enough time to make two other large flowers. 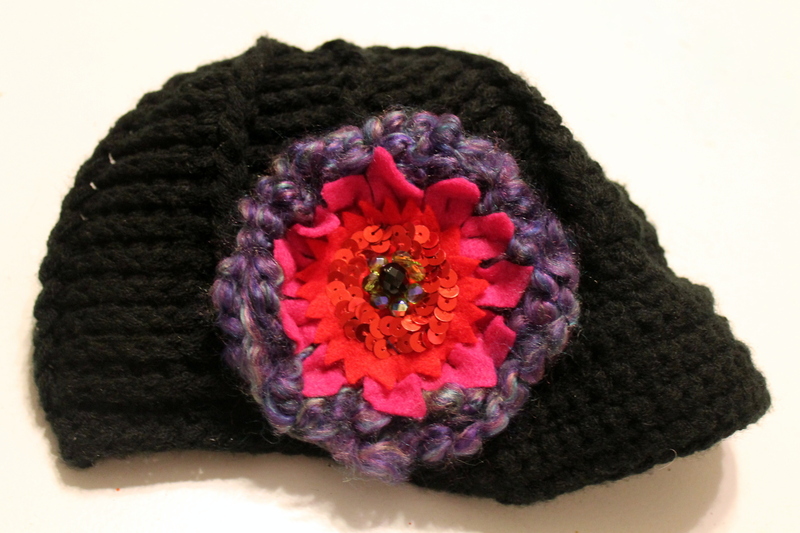 I was going to add them to my scarf, but then I remembered some of these hats I had at home. Now I have some overly-bedazzeled head-gear. 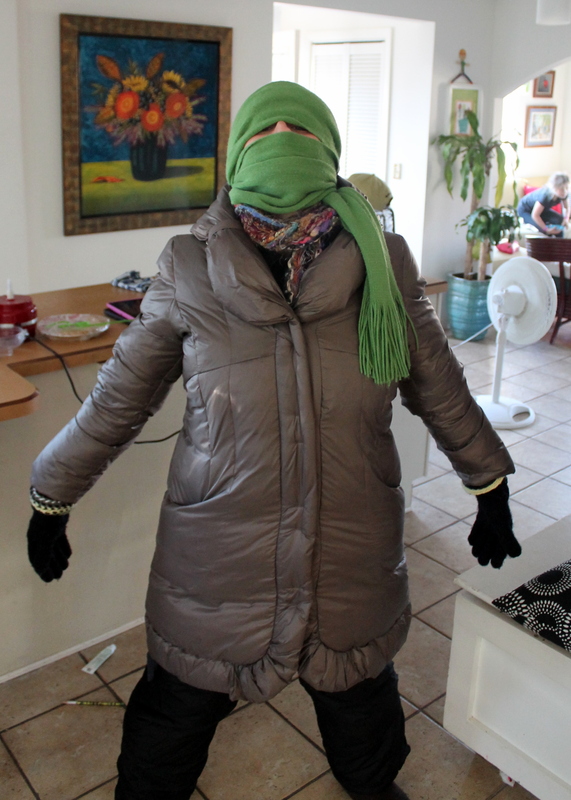 I am ready to take on the cold! I have to say I am feeling incredibly unorganized. I feel like I should have created a token piece of turkey art today, but that would have required at least three days of planning. Three days ago I was trying to figure out what I was going to make three days ago, so if you catch the trend, you’d know I’m barely hanging on! I decided to keep going with what I’ve been working on this week. 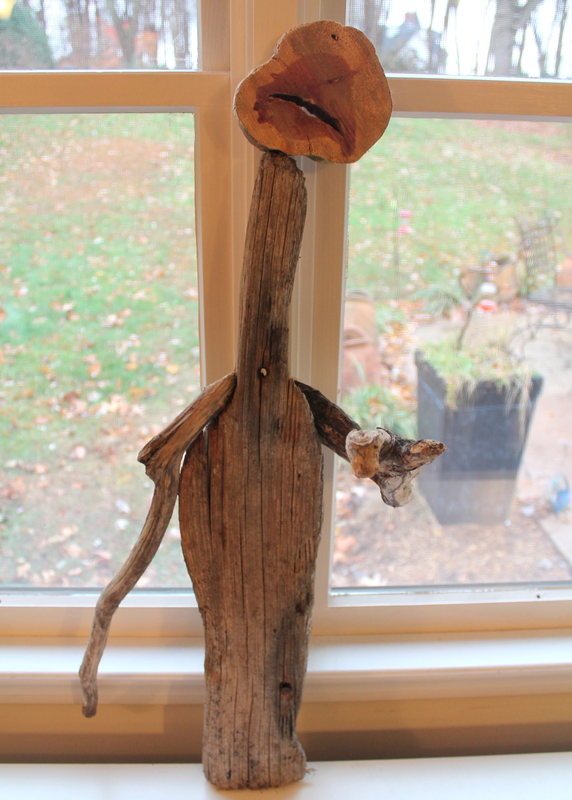 Today was one of my favorites, a really twisted couple pieces of driftwood I found. I just marvel at mother nature. Can you believe I found a piece of wood with such a perfect bird face? The wings are separate, yet they seem like they could have come from the same tree. Not so. I found the wood at two different beaches. 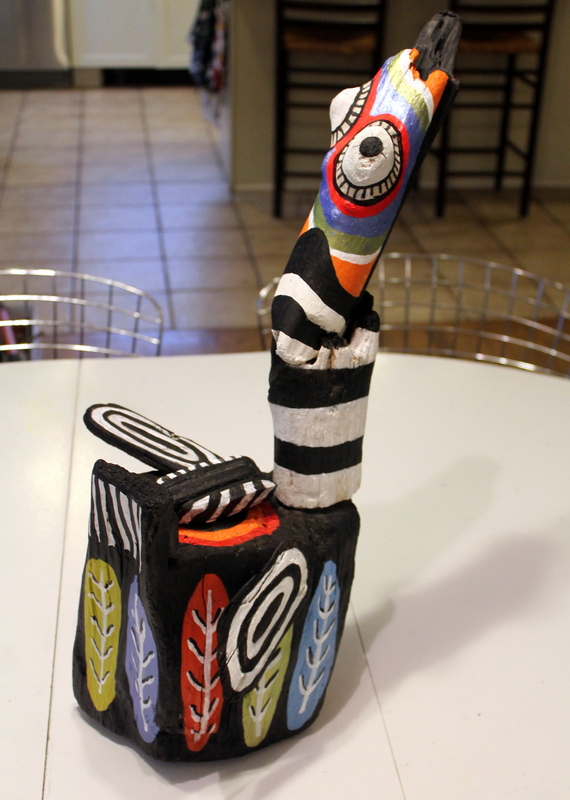 I nailed the pieces together the other day and today I decided to paint it as well as create a pedestal with a dowel to suspend my bird in the air. I had to be at my family’s house for noon which meant in order to create something for today I needed to be an “early bird”. Get it? That’s how I came up with my name for today. I had to pack my kids luggage for the next few days, prep some appetizers for Turkey Day and then pack up some art supplies to travel with for the next few days. This was the other bummer. All the appetizers came out and I was stuck on the floor in the naughty corner working on my art for today. It’s really hard to stuff your face and paint ya know. Don’t you worry though, some how I managed! I have to thank my family for this year. They are such troopers. I’m always off in the corner doing my own thing and they step up. They help with whatever I would have been doing if I wasn’t making art and cheer me on at the same time. I can’t tell you how many family members sternly looked at me at 8pm tonight and asked if I had gotten my blog done yet! This 365 challenge has not only impacted my life thus far, but also EVERYONE around me. Especially my husband. Man I don’t even know where to start. When they say 99% of your life’s happiness depends on who you marry, I constantly pinch myself that I could have been so lucky. Thank you husband. Then there’s those kiddos of mine. I don’t think they even remember mom before this year. Mom didn’t volunteer at school as much this year, she missed a lot of field trips, her afternoons were generally spent finishing up some crazy project, she wound up on the computer every evening and I’m sure she has come off just a little bit crazy, tired and unorganized. The truth is, I can’t do it all. If you are 100% committed to one area of your life, then the other areas of your life take a hit. However, I did stay home with my little cherubs for the past eight years and all my creative juices went directly to them. So, we’ll say by the end of this year -we’re even! I do need to thank them. They go with the flow, they roll with the punches and still show nothing but love. The upcoming year will be spent trying to find a true balance. I need to find an outlet for creativity, yet honor my family and other areas of my life just as equally. I’m pretty sure this is a struggle for most of humanity. I know I’m not alone. It’s so very important though. I leave you this evening hoping you all enjoyed your Thanksgiving, family and friends. Today is a great day to take stock of your life, figure out who needs to be thanked and what there is to be thankful for. I hope you feel as blessed as I do. I really do! 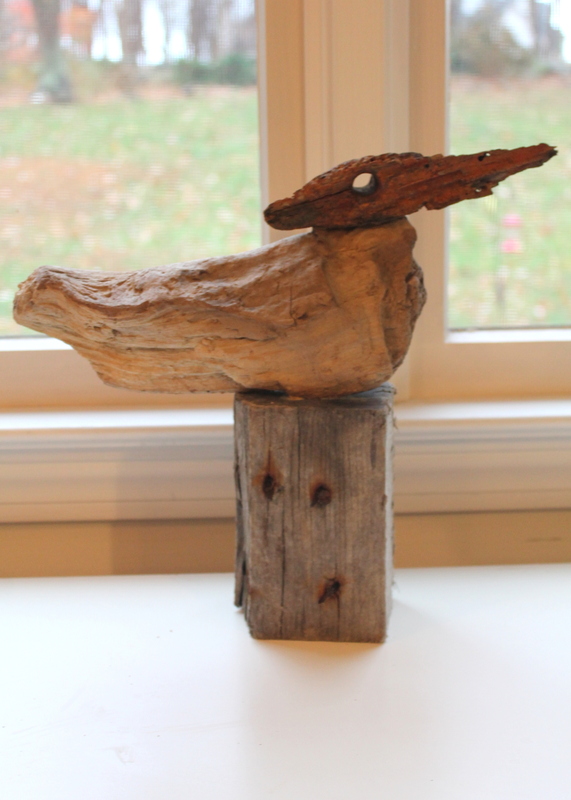 I finished my “Wild Goose” sculpture made from driftwood found at the beaches here in Rhode Island. 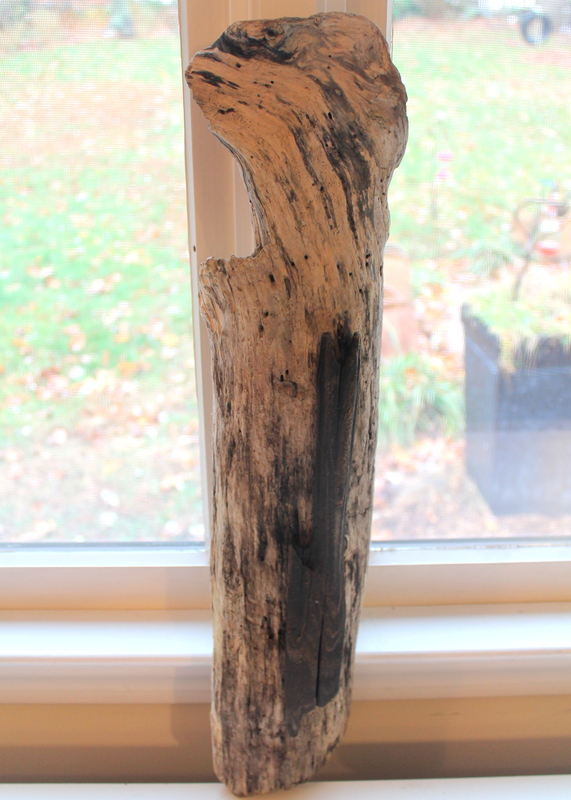 This is how the raw pieces of driftwood looked. 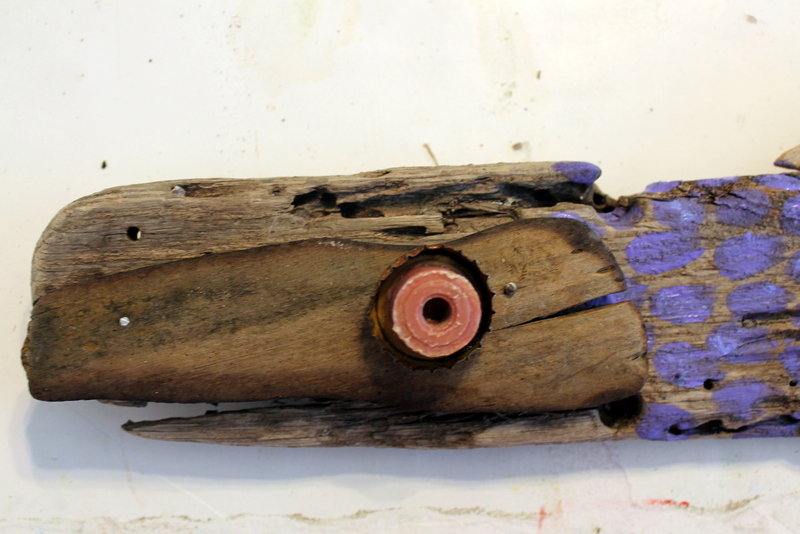 When I found that top piece of driftwood on the beach and I saw the natural eyes that could be created from the wood knots, I instantly thought bird head. 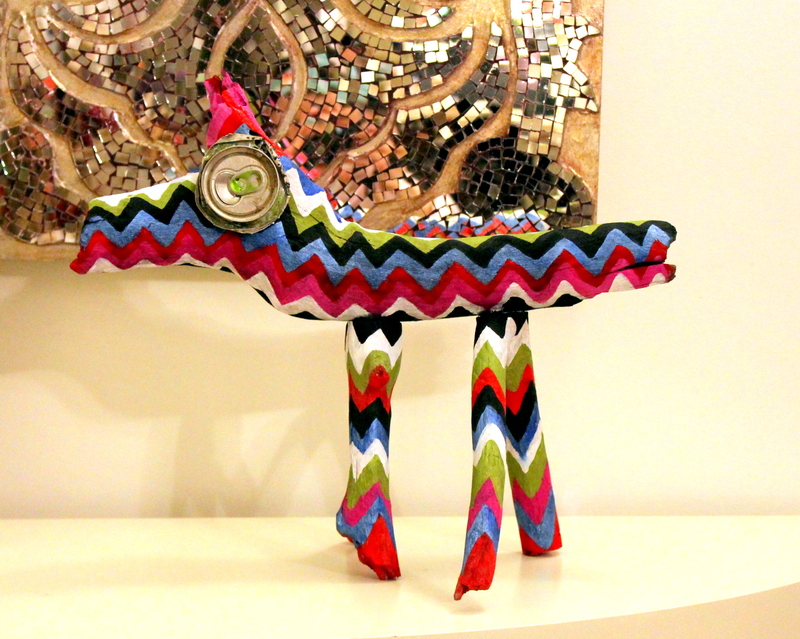 I just love creating things out of what you find. It reminds me of looking for images in the clouds. If you stare long enough, things begin to emerge. This is as far as I got the other day. Today I decided to add a back fin or a hump. 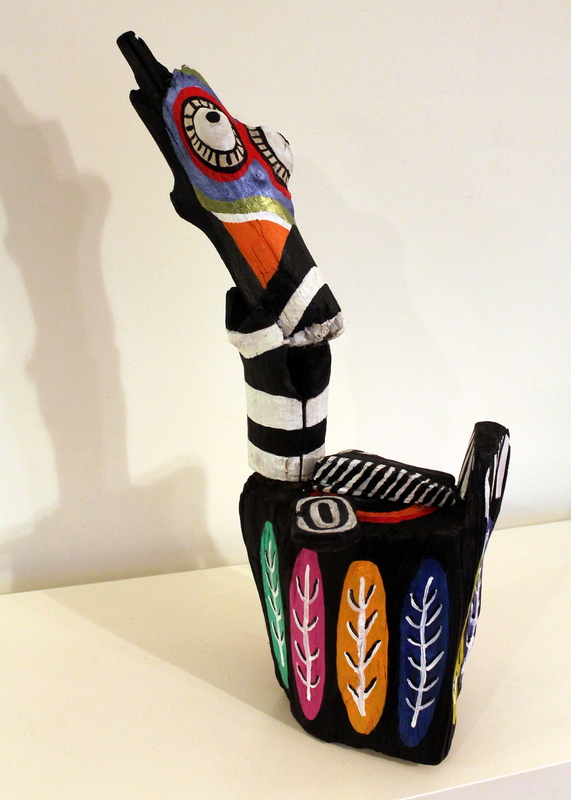 I also added color to the head and details to the feather patterns. 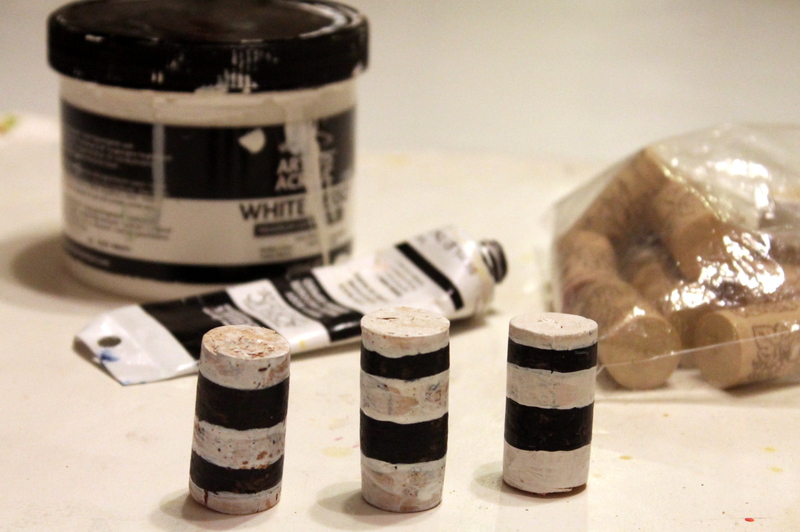 I also began to paint four lengths of driftwood in black and white stripes. I was going to make legs for my creature. It then occurred to me that geese have two legs not four. 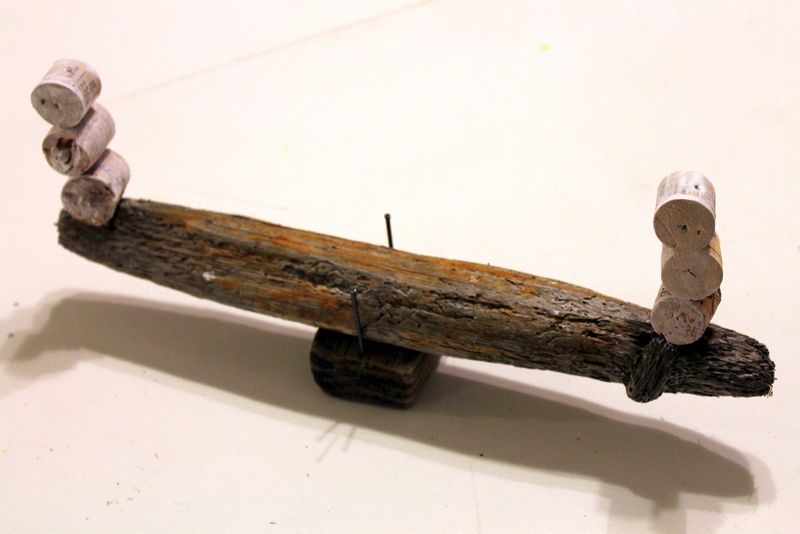 Two would not balance this heavy wood structure, so I abandoned the idea. It has been good and windy the past two days. I am going to try again to head down to the beach and see if I can find suitable legs. I think black and white striped legs would be a fun addition. 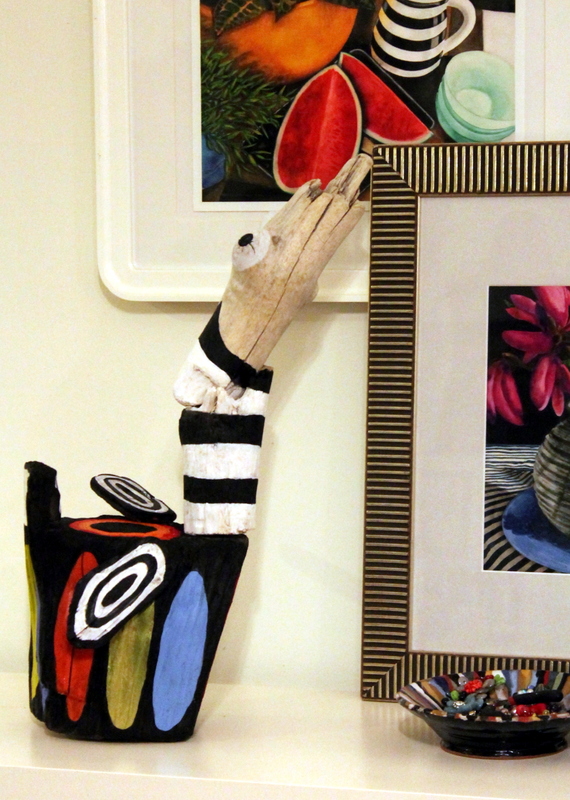 For now my silly goose is hanging with some of my black and white decor in the living room. 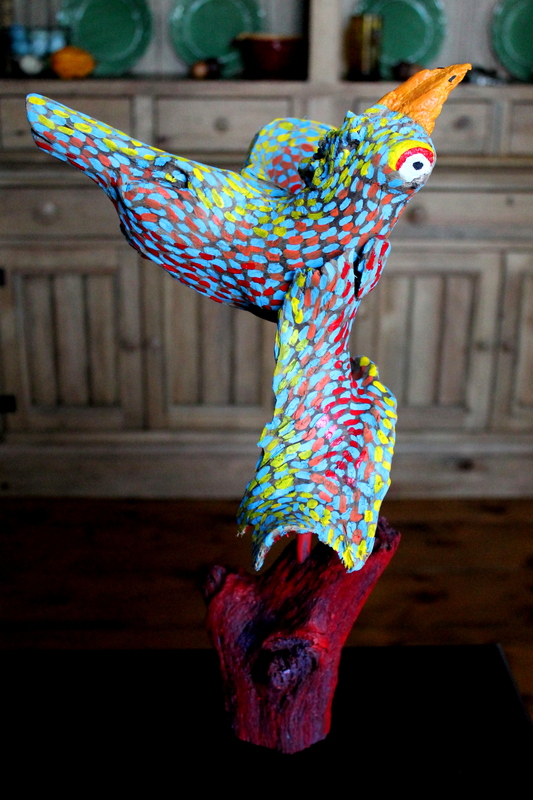 It’s cool painting your own sculptures. Magically they tie in to my personal style. Fancy that! Tomorrow’s Thanksgiving. I will be hanging with my family and playing with my niece, nephew and our kids. We usually have a game of capture the flag and assassin (you murder people throughout the day with a wink or handshake, if you’re killed you need to drop to the ground and act out a dramatic death, then everyone has to figure out who is the assassin). I know. I know. It doesn’t sound all that festive and Thanksgiving-y, but the kids love it, so thus it shall be our family tradition! I have a bit of traveling to do over the Thanksgiving weekend and Christmas holiday. 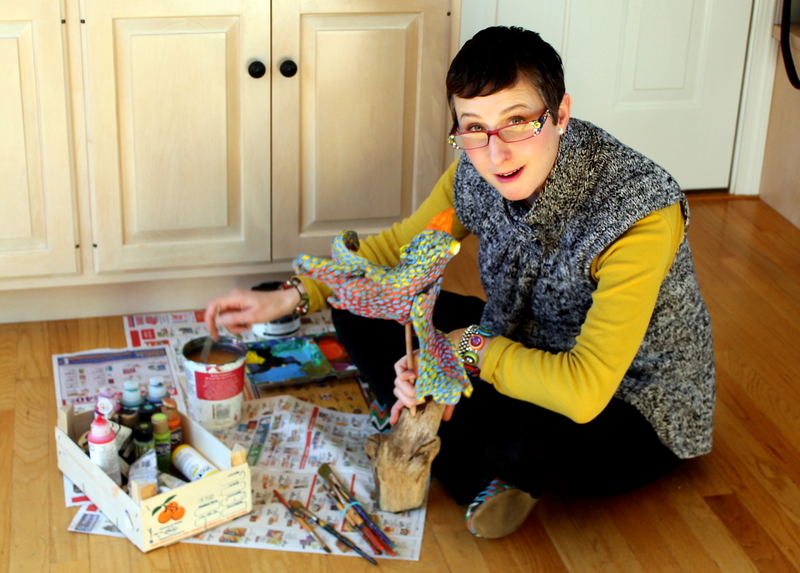 I only have 36 days left to my creativity challenge, but the upcoming month may be the most difficult yet! It’s a super busy time of year. The only way I have figured out how to make it through the past 331 days is not to worry about tomorrow. So that’s my plan. 36 days of not worrying about it. On days I have time I will push myself as far as I can go. On days where I spend 5 hours in the car with whining children, I shall go easy on myself. 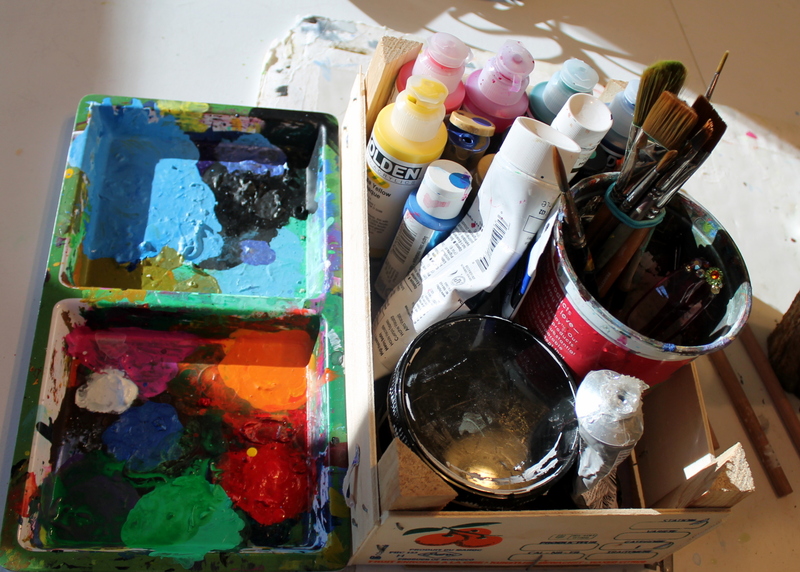 Either way, creative opportunities always seem to present themselves. The unexpected always seems to go better than the over-planned. It shall work itself out. After this I have a whole new something to worry about…what do I do when I’m done? The answer is I have no idea. I’m hoping my near future will unfold in some perfect design. I hope this, because I really don’t know what comes next. It’s been nice knowing my objective for a year now. I’ve always felt like I don’t know what I’m doing. It’s never very concrete. This challenge was a great way to put a label on my life. To have some way to answer when people ask what I’m up to. I’m done though. It’s served its purpose and run its course. It’s time for me to reassess and pick another direction or simply rest. I thought for sure I’d finish this goose in one day, but it wasn’t to be. I started bright and early 8am. I created a feather template from my recycle bin. I assure you, when I am through, they will look a lot more like a feather motif! By 3pm I had mostly only completed the under-painting. 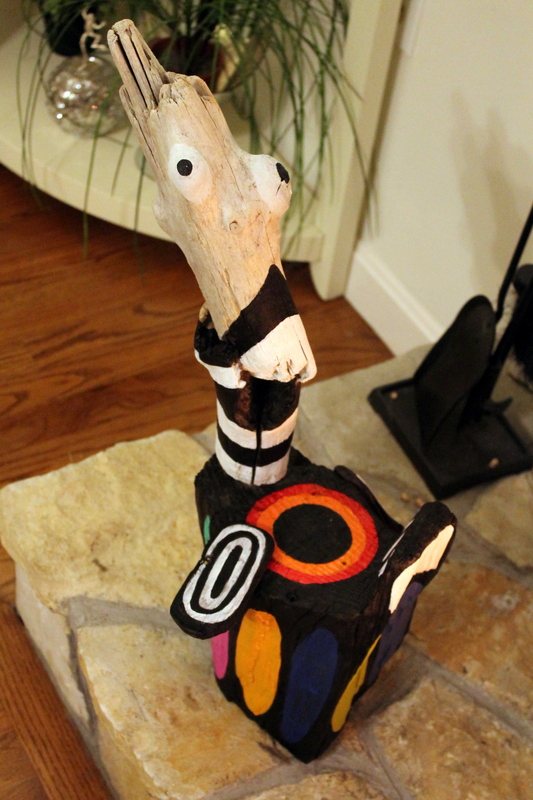 I’m not sure if this is due to my driftwood goose’s size, which is around 2 ft high or the fact that the dried out wood sucked up so much paint I had to go over every area 2-3 times. Whatever the reason, I’m only half way there on this creature. I still haven’t figured out what I want to do for designs on the head. I also plan on adding some of these corks too. 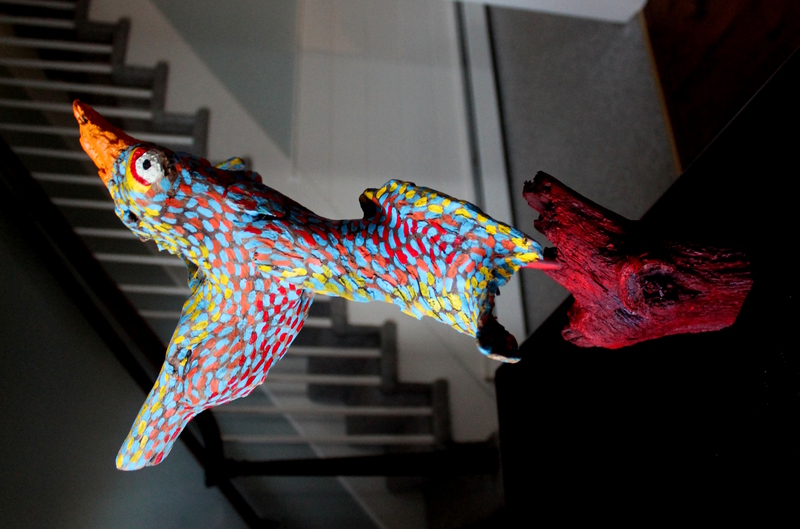 Either way, I love having these brightly colored 3-D objects around the house! Tomorrow is my favorite day of the week, pottery day. Maybe I will try to be disciplined enough to leave the pottery studio when I’m supposed to. I generally stay an extra two hours. I will try to leave early and finish this goose. I better. 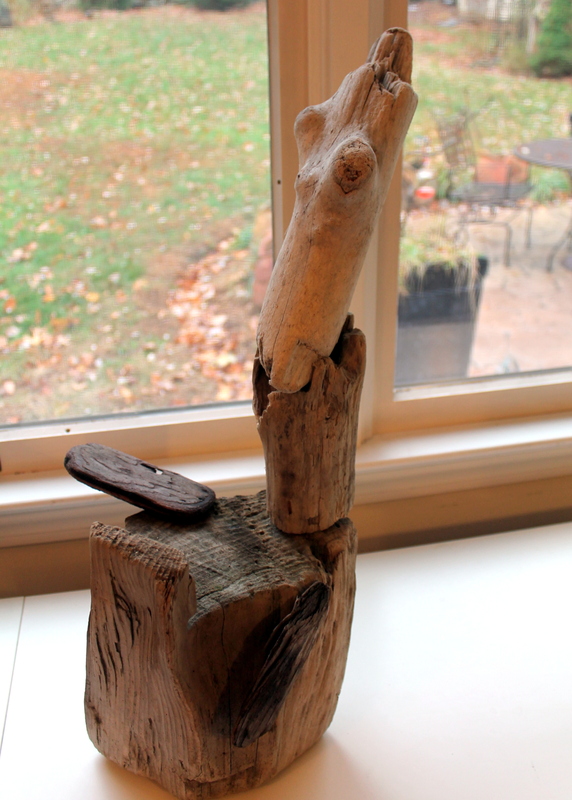 I still have five other driftwood sculptures waiting to be transformed! Today I was a glutton for punishment. 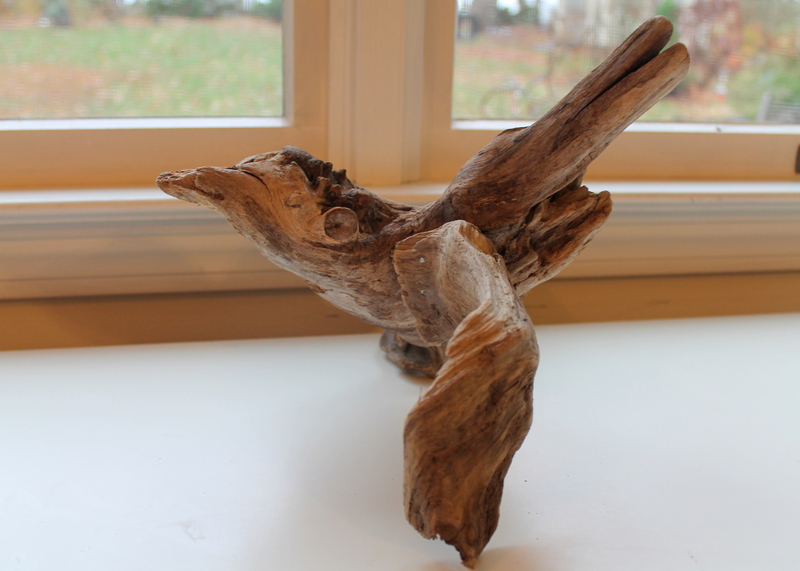 I still need some key pieces of driftwood to complete some of my sculptures, so I decided to hit the beach. If you are not from New England, then let me fill you in on the weather. It was about 20 degrees today but with the wind chill, it was estimated to feel about 9. Great day to go to the windy beach! 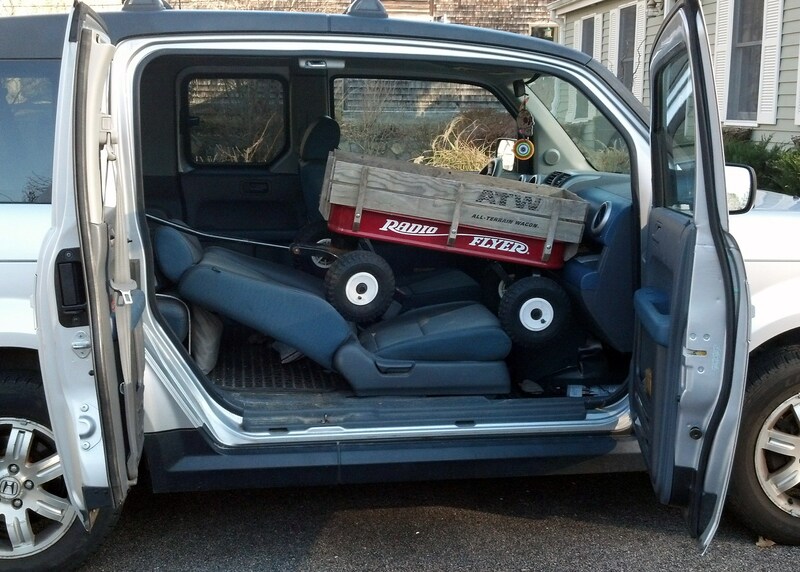 I wised up this time and brought a wagon. My arms are still sore from lugging driftwood. The beach I went to was an absolute disappointment. 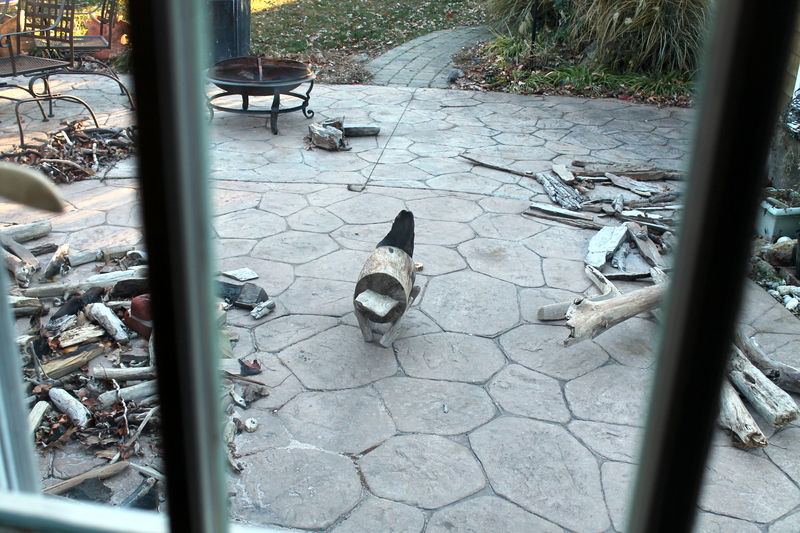 I came home with a headache and an ear ache from the wind and only about 6 small pieces of driftwood. None of which were what I needed to complete my pieces. It was so windy I thought I was going to blow over. I love having the beach to myself, but there was a reason I had it to myself today, it was nasty! 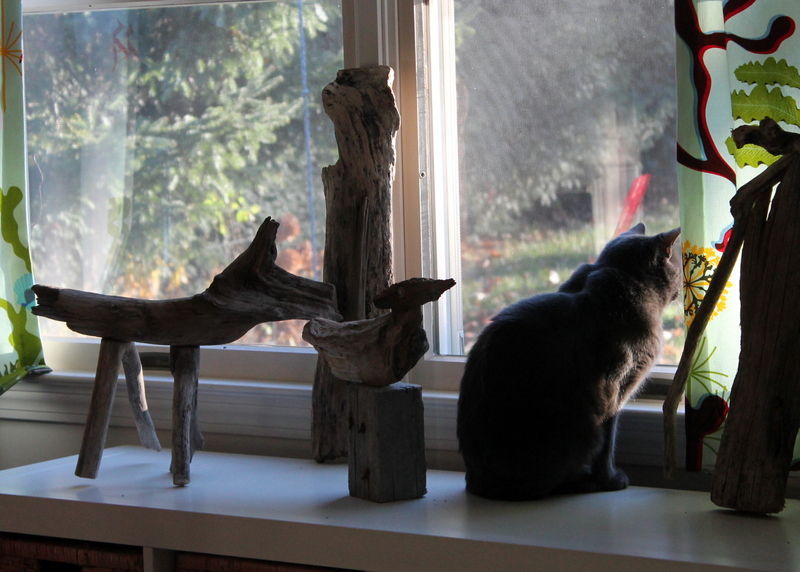 I came back home and it seemed like all my wooden sculptures were waiting for me. We got back down to work, my daughter and I, we had wood shavings, nails, wood and saw dust all over the place. There was absolutely no way we could work outside in this weather, so we moved it all inside. I have to say my 9-year-old daughter was way more productive today than I was. She tells me all the time how much she doesn’t like art and how she has no interest, what a liar! On her own, she decided to create some Christmas decorations. I just love this snowman see-saw. The snowmen are corks. 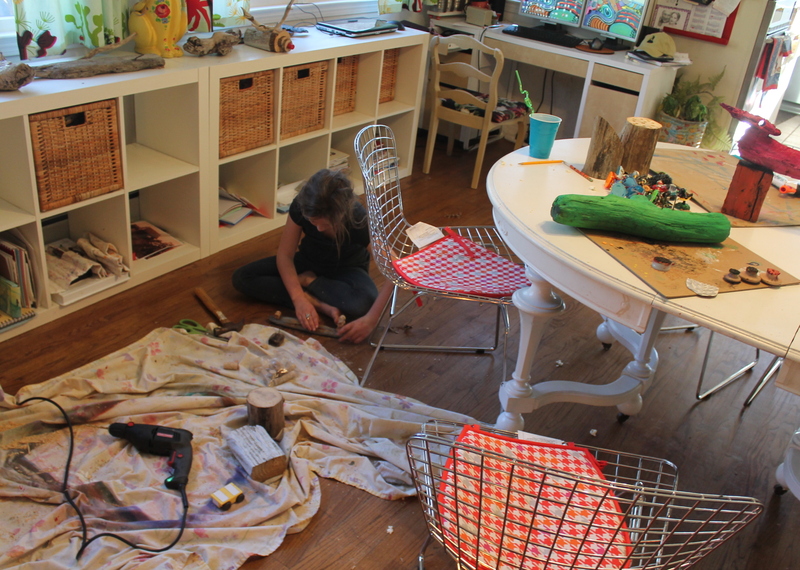 She nailed them all together and created a functional lever and fulcrum….show off! I wound up adding a log for visual interest and I’m glad I did. 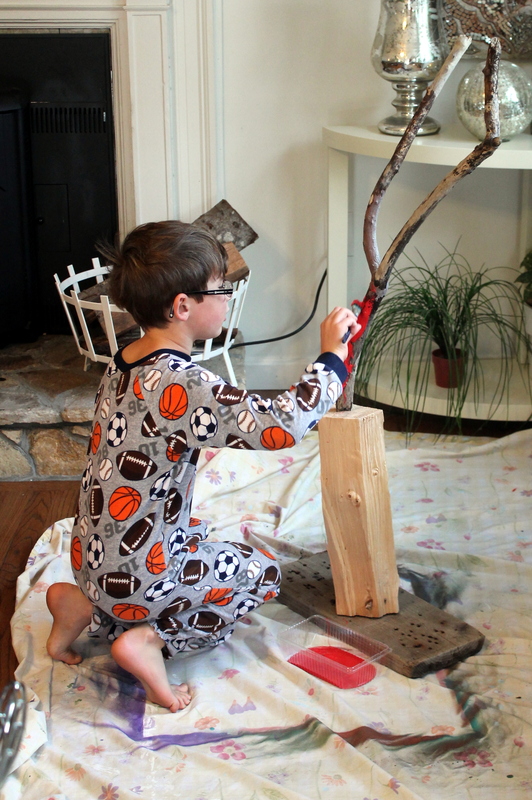 The faux-bois log is my favorite part! 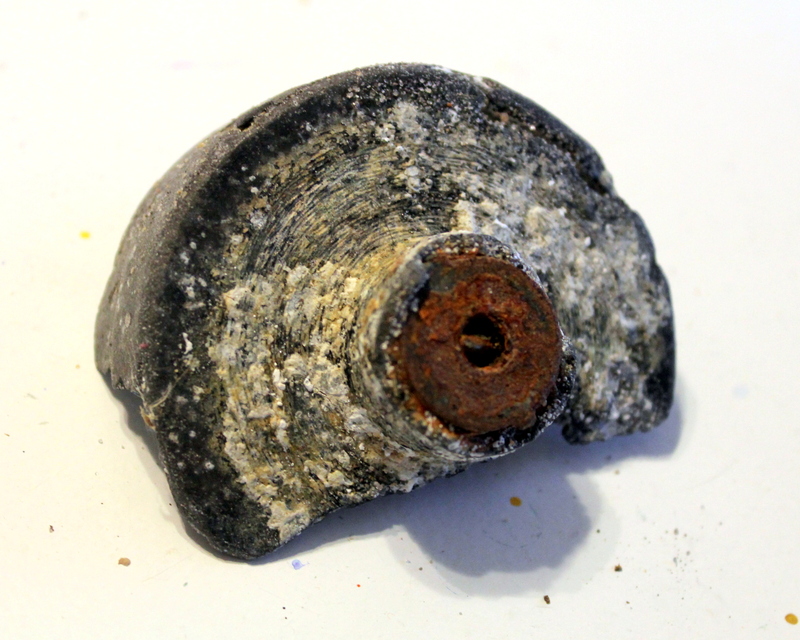 I had also found this rusty wheel shaft on the beach. I thought it would be great for an eye. Unfortunately, I thought I could drill two small holes in it which I couldn’t, I wound up cracking about 3/4″ inch off the side of it. That stunk. It was absolutely perfect, but I went with what was left and it still adds some visual interest. 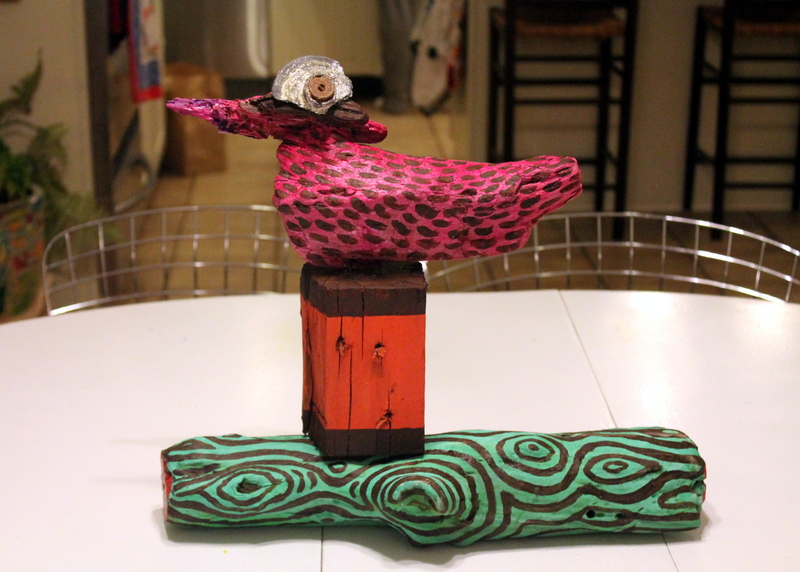 You know, originally I was thinking of painting this bird to look like a seagull, but then I thought about how many people in the world have painting a seagull out of driftwood. My second thought was to go with something wild from my imagination which I think was a good call. 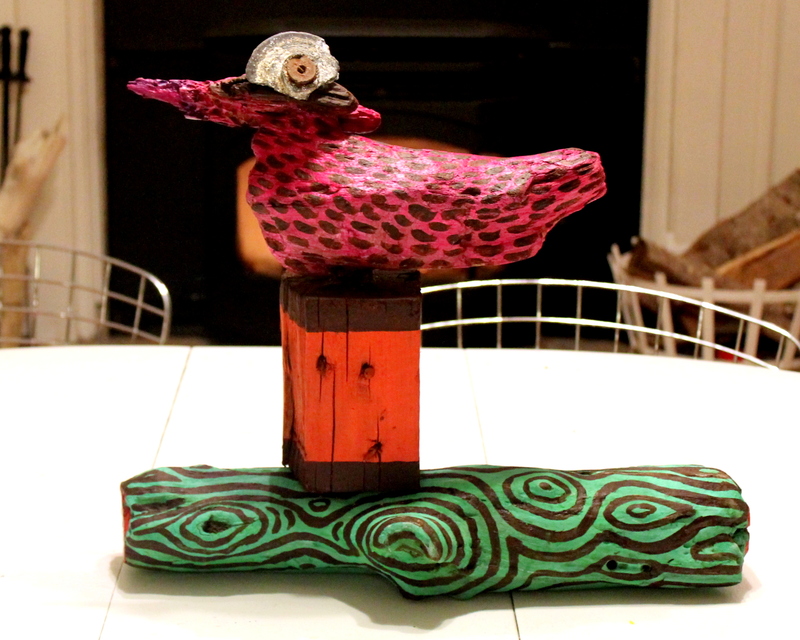 My driftwood duck is wild, over-the-top and oh-so very colorful. It ties in with all my art kicking around the house. I have to say I am truly digging the 3-D element to these pieces as well. With all of the paintings I’ve been creating, everything winds up being some form of a rectangle. 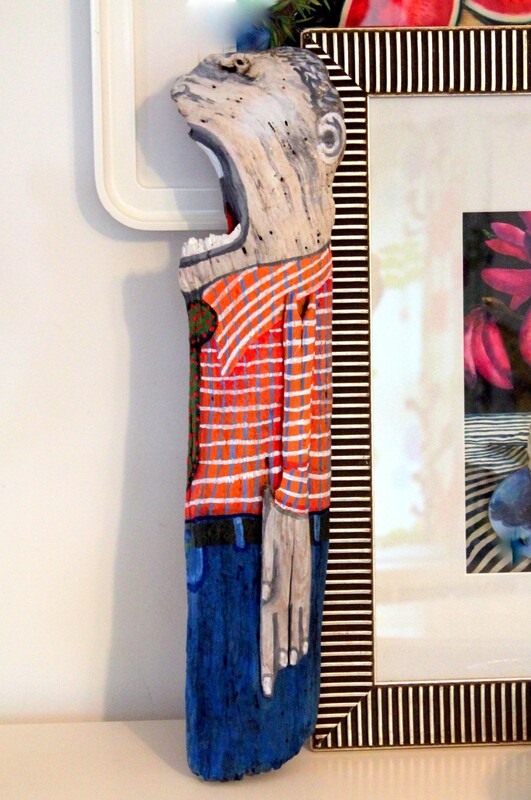 These pieces are adding some dimension to the room. Who knows, some of these creatures might wind up permanent dwellings in this place. I plan on tackling my goose tomorrow. 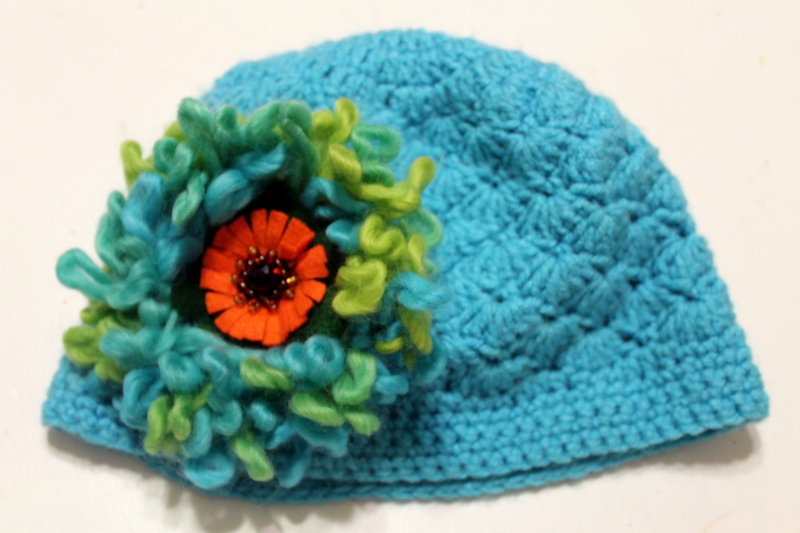 I’ll have to dream up some crazy color combinations tonight. I already have a fun idea for the neck. It’s going to be crazy! 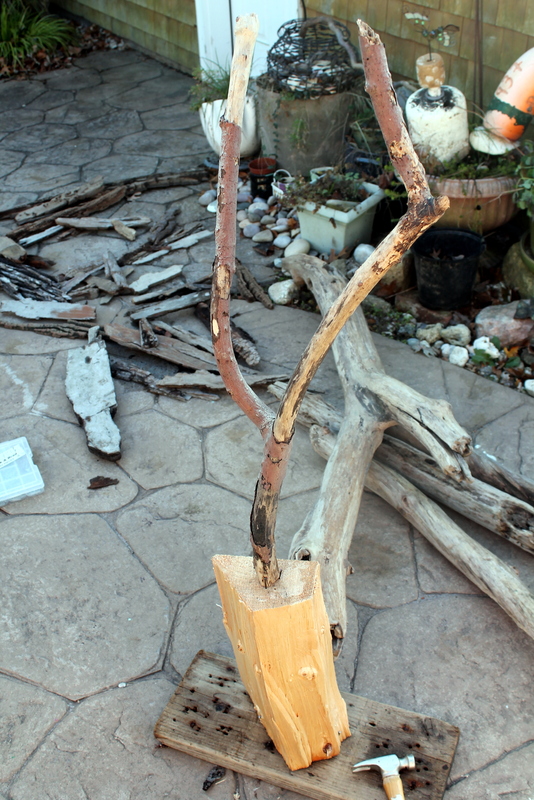 After hunting and dragging half of South County’s driftwood back to my patio, I am getting to the fun part. 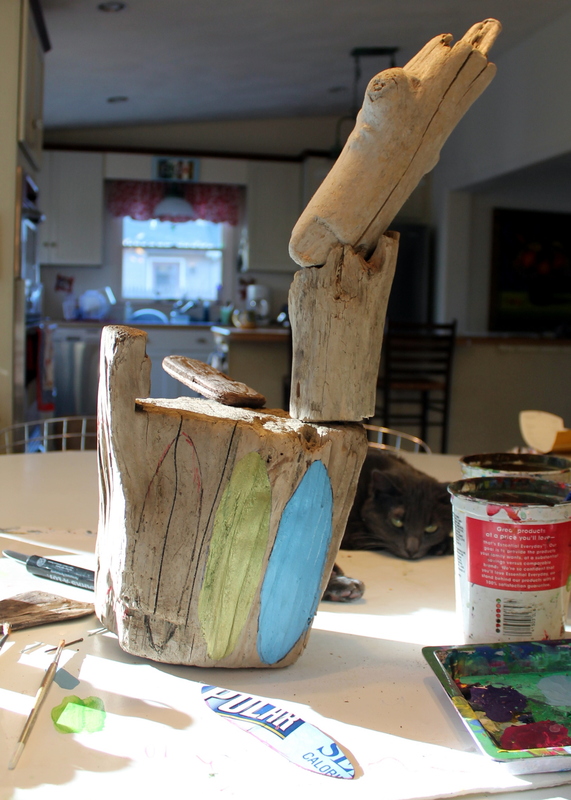 Painting the driftwood to bring my creations to life. Weekends are always a different can of worms. 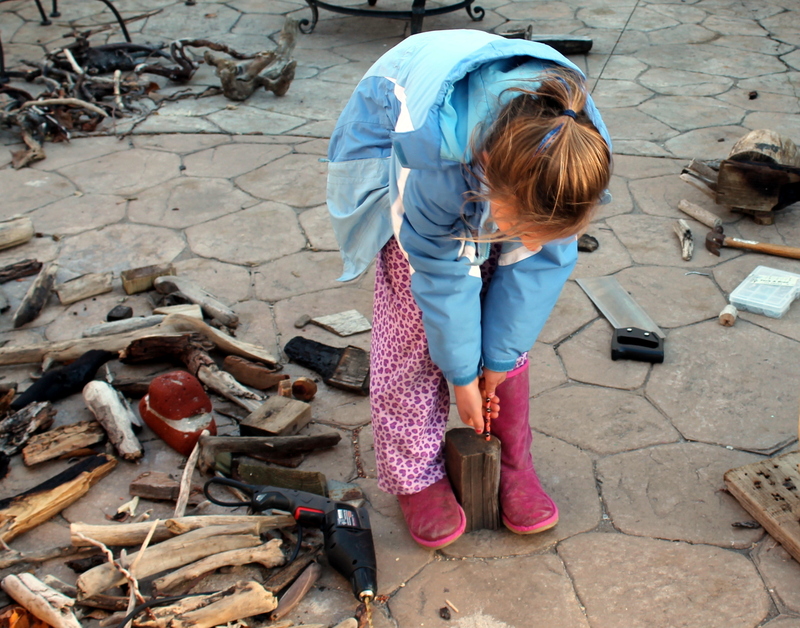 If you have a patio full of wood, power tools, saws, hammers and nails, the children will come and like a moth to a flame, they did. 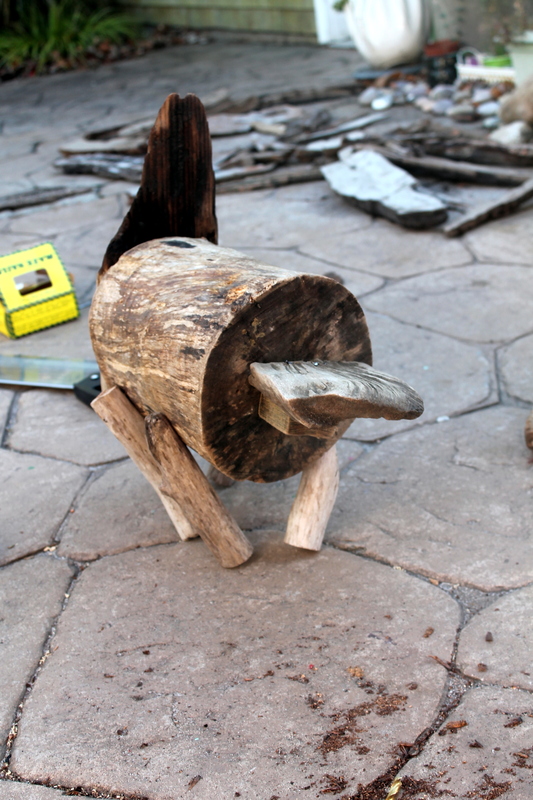 My son decided he wanted to make a giant catapult. He’s painting it red. Any guesses on this one? My daughter’s favorite animal, the platypus. Here’s another little detail. I used a bottle cap and gun shell casing I found on the beach. 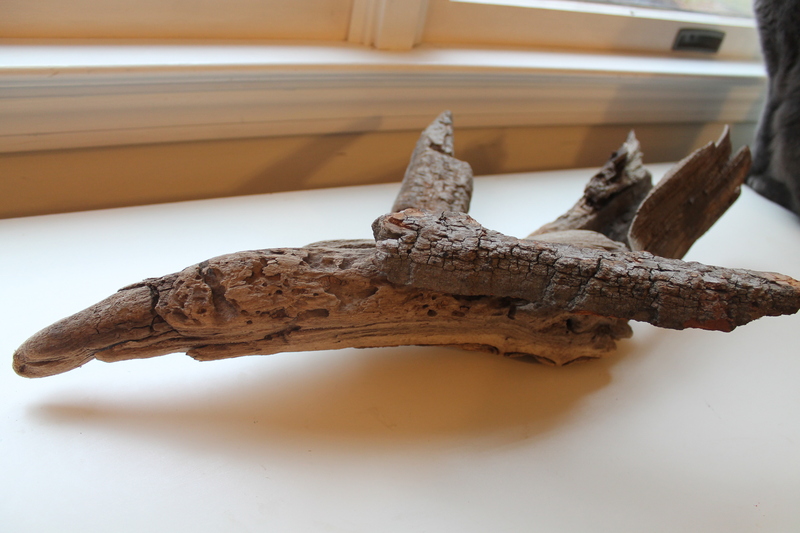 I plan on heading back to the beach to find a few more pieces of driftwood. Now that I’ve started this project, I know what I need. I’m looking for some head shaped pieces of driftwood and stumps if I can find any. 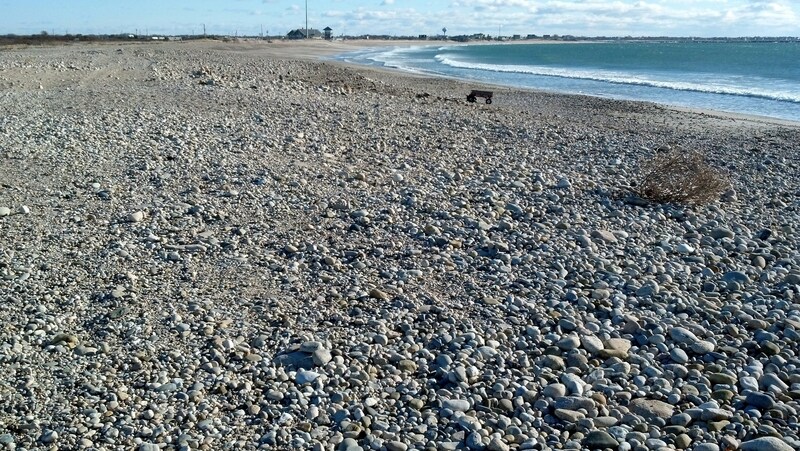 I hate to say I’m disappointed we didn’t have any hurricanes this autumn, but there’s slim pickings on the beach! 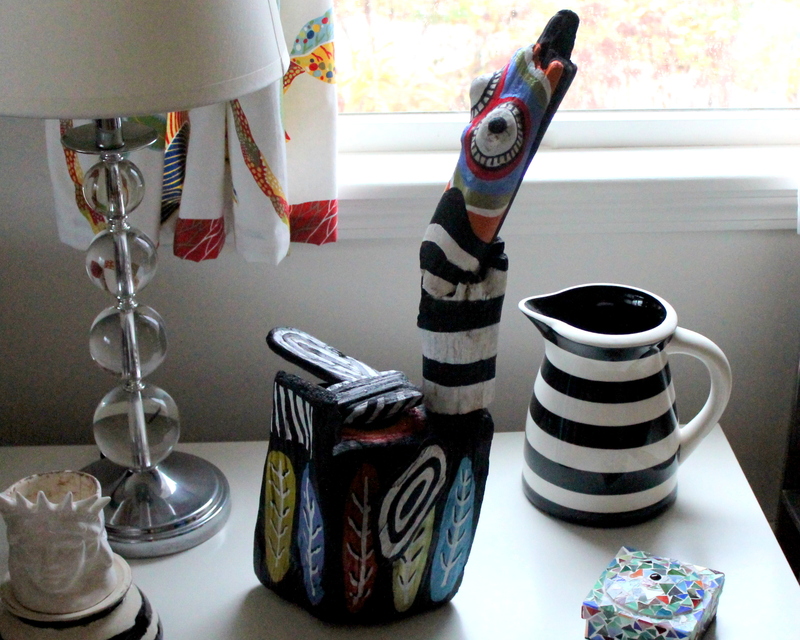 My dining room is beginning to look like a wooden zoo. What on earth will I do with all of these sculptures when I’m finished? Yesterday’s post was all about the hunt for driftwood, today is all about figuring out what to do with it now that I found it! 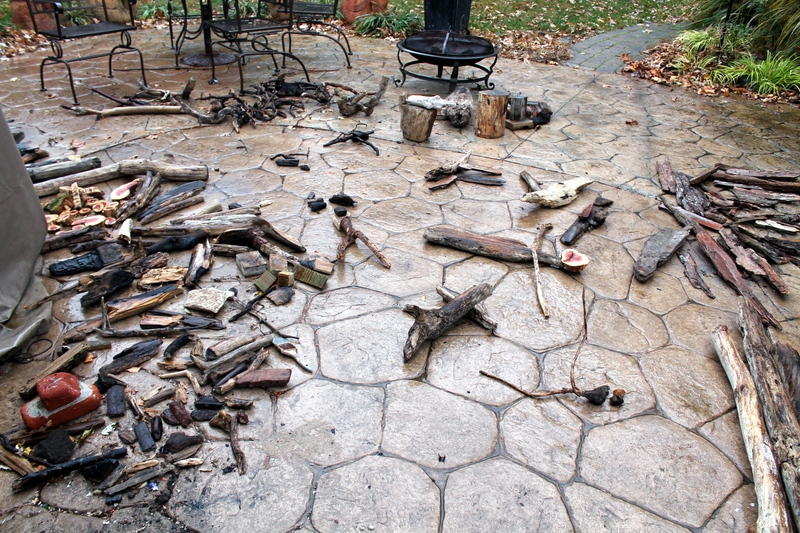 Of course because I needed to sit down and inspect every single piece of driftwood, it rained. Murphy’s Law. I manned up, grabbed a hat and scarf and sat out in the rain trying to find figures amongst the debris. This added an extra step to my day since I now had to bring my desired pieces of wood inside and place them by the fire to dry out, but hey, got it done! 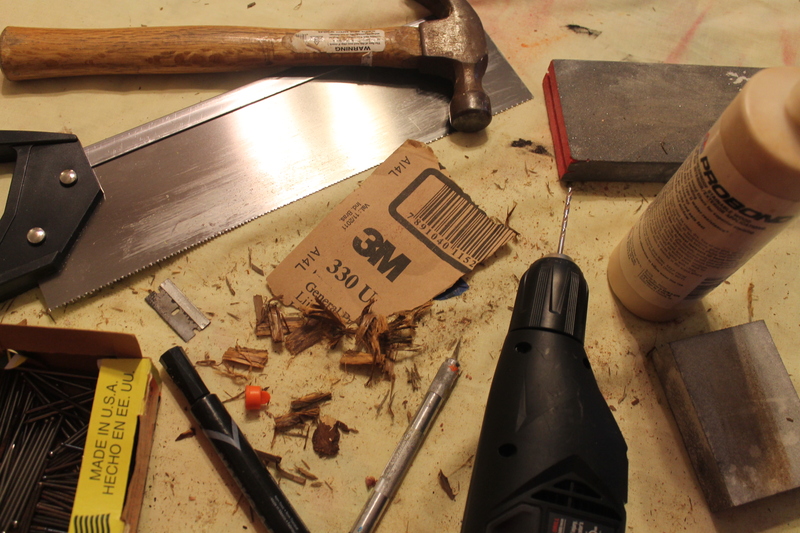 While the wood was drying, I got out all the tools I’d need to assemble wooden sculptures. A little hammering, a little drilling, a little sanding and from the wood came life. 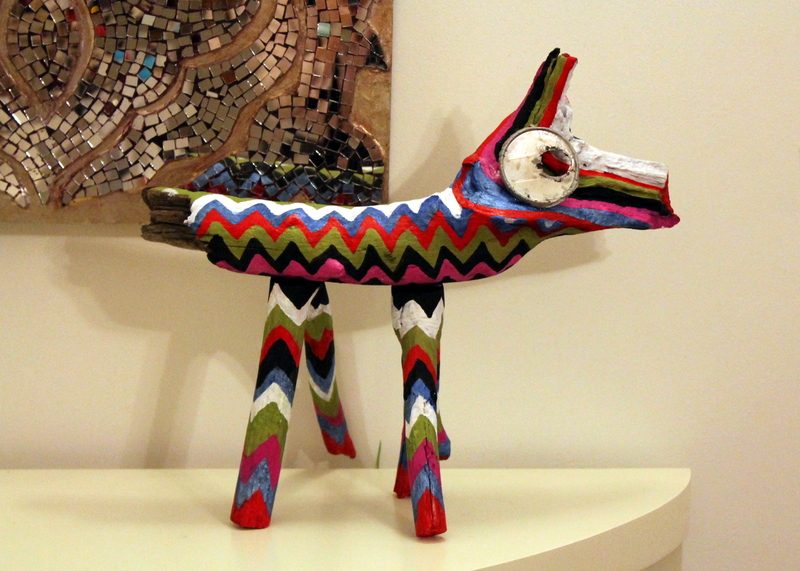 There are a few pieces where the knots in the wood lined up perfectly to create eyes and other poignant details. I’m going to add color of course. You didn’t think I could possibly leave them natural did you? First things first. Tomorrow I will create pedestals and posts for some of these pieces. I may even hit up another beach. I need some better “head” shapes. …we’ll see where the day takes me!